Whatever the occasion, get your celebration off to an explosive start with this fun-packed collection of 19 songs, bursting with energy and guaranteed to put a grin on your face and a cheer in your heart. Available with Words on Screen™ v2. 3 warm-up songs to help with warming up the voices, diction, articulation and warming up the body and brain, including an exciting fireworks warm-up! It’s time to throw a party, it’s time to celebrate! 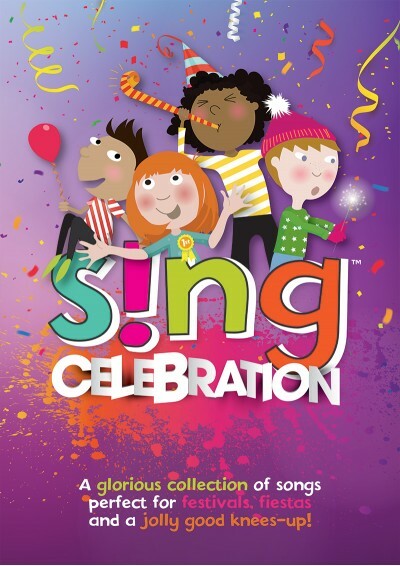 There are many different reasons to celebrate, so whether you’re marking special days throughout the year, celebrating a great achievement, or simply celebrating life, this versatile collection of children's celebration songs will suit your every need. So go wild, have a Fiesta, Jump For Joy, Give Yourselves A Clap and celebrate Each And Every Day! What do we do when we celebrate? WE SING! S!ng™ is a fabulous series from Out of the Ark Music designed to get your school singing about almost anything and everything! Perfect for assemblies, choirs and group singing. Books in this series contain ideas and tips on how to get going, vocal warm-ups to prepare your voices and a whole mixture of irresistibly singable songs, featuring opportunities for rounds, harmonies and solo and group-singing. With a song chart giving all the vital information you'll need for each song, it's easy to choose an appropriate song for each occasion at a glance.